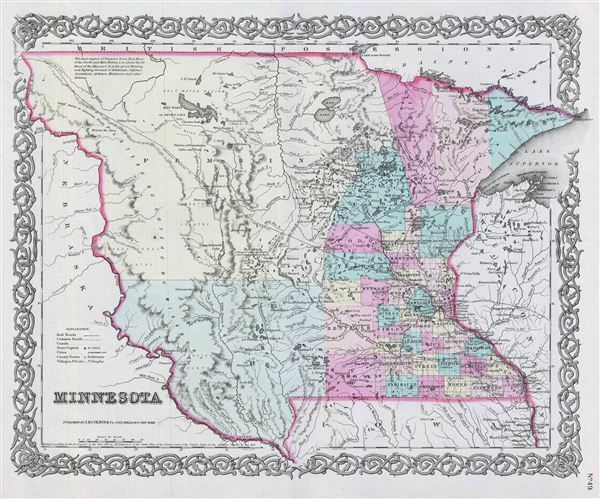 A beautiful 1855 first edition example of Colton's map of Minnesota. This is one of the most desirable of all Colton atlas maps. Like most of Colton's state maps, this map was derived from an earlier wall map of North America produced by Colton and D. Griffing Johnson. Covers the vast territory of Minnesota, which included modern day Minnesota, North Dakota and South Dakota. When the map was drawn only a small portion of southeastern Minnesota hand been platted for settlement, the remainder of the territory was dominated by a number of large and powerful American Indian nations. These included the Yanktonnan and Chippewa. The map identifies the Chippewa and Long Prairie Indian Agencies. Also offers notes on the salinity of various lakes in the region and the locations of trading posts, such as Scottsman Martin McLeod's Trading Post on the Minnesota River. As the rest of the Nation was descending into the conflicts that would lead up to the American Civil War, Minnesota settlers were increasingly agitating the various American Indian nations in the region – many of whom had been resettled there in the previous decade. In 1862 the Sioux Uprising or Dakota War wherein the Sioux, under Little Crow, attempted to defend their territories against white incursions. Like most wars between the U.S. Government and indigenous Americans,' the Sioux Uprising ended tragically with over 1000 Dakota held captive and some 38 Indian leaders executed. This map also identifies various forts, rivers, mountain passes, fords, and an assortment of additional topographical details. Map is hand colored in pink, green, yellow and blue pastels to define state and territorial boundaries. Surrounded by Colton's typical spiral motif border. Dated and copyrighted to J. H. Colton, 1855. Published from Colton's 172 William Street Office in New York City. Issued as page no. 49 in volume 1 of Colton's 1856 Atlas of the World. Rumsey 0149.054 (1856 edition). Phillips (Atlases) 816.